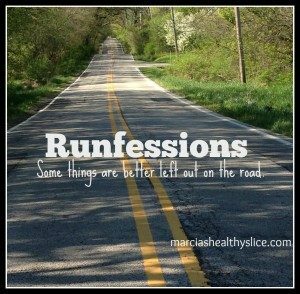 I don’t have email on my phone, so trying hard to play catch up on what I missed in Runfessions, Tuesday Topics, Coffee Date and Weekly Wrap. But disconnecting can be wonderful. I didn’t post too much while we drove, but it was great to finally see Richmond even though the museum we wanted to visit was closed. Not having email on my personal phone was a decision I made when I got the new phone in March and I don’t regret it at all. Really what personal email isn’t spam these days? Does anyone still use email as a primary means of communication outside of work? That’s crazy to think of, but we’ve swung back from give me your number to give me your email to give me your number to text. I just finished Isabel Gillies’ A Year and Six Seconds (loved it!) and one point she made when a friend offered to set her up on a date post-divorce was that there was no email when she dated her first husband. Crazy! I had no idea there was a Five Boroughs series patch. So cool. Used to love collecting these when I was backpacking. Want to think of somewhere more exciting to put this than my corkboard. It’s tempting me to do 4/6 again, but I really don’t think it’s on tap for this year since I’m out of town for Brooklyn and not sure I want to do Queens again. We’ll see. I actually eased way off on running after the Half as I said I would to try and get Achilles/calf resolved. I really don’t want it to linger. Luckily this seems to be helping although I was worried about my back to back races which I scheduled before this flared. All the cross training this last month reminded me that I miss rowing, and do like the Lateral, which were both pleasant surprises. Monday: stairs were OK and Achilles wasn’t terrible, although swollen, so I went to the gym for a good stretch,roll and short cross train. Never miss a Monday is hard post-Half! Epsom salt bath when home. Tuesday: feeling better. 5K row, long stretch, roll, epsom salt bath and ice. Wednesday: off. Late night at the office and legs needed a day off. Thursday: no office run group due to schedules and I wanted a short test of my leg so I did the lower loop of Central Park. Slightly annoying, but not so I’d call it pain. Iced well after. Friday: leg one of the aforementioned drive to Florida. Overnight in Florence, SC and we didn’t get in until nearly 11PM so although I scoped out the fitness center, I did not do anything but fall into bed. Saturday: leg two. Hotel treadmill was weird so after a half mile, I switched to the elliptical for 20m before the drive from Florence to Delray. I would be AOK never seeing I-95 again. Monday: ran to the beach and back. Just a shakeout and longest test of my leg. It definitely stiffened up on the flight home, and iced it well that evening. This never miss a Monday was beautiful! Tuesday: was feeling three days in a row on the achilles so went for long stretch and roll and some kettlebell work. 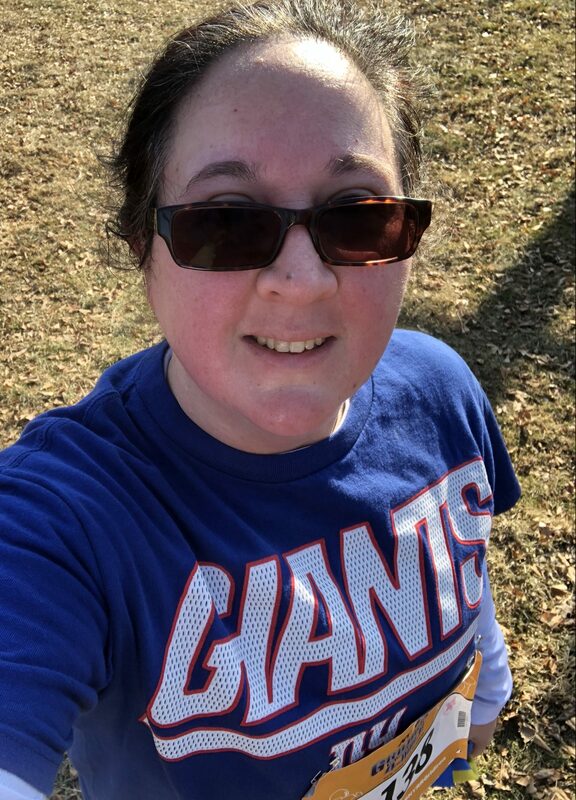 Wednesday: ankle was feeling good, and we closed early for the snow squalls/Polar Vortex so I made time for a 5K LateralX. That is hard. And long. It’s almost 20m longer than a 5K run. As I said, the last thing I wanted to do was ice my ankle when I got home, but knew it was the smart thing. I’d also argue I was continually icing it by walking around in this weather. Friday: off, sneaker shopping. While I’m pretty confident the issue was my prior pair of Vongo 2s running out of miles early, I still needed an actual solution as New Balance no longer makes the Vongo 2s and the 3s are just too wide. I went to JackRabbit and let them play. We had some trial and error, and amusingly I came home with the 860s which I’m pretty sure ETA: (YEP!) are the ones the clerk had me try too when I first landed on the Vongo 2s. Apparently the new model of these retained the good of the V2. Going to try them next week when I hopefully get back to some treadmill runs. Saturday: Frozen Penguin 10K. My beloved first race moved to February and offered a 10K this year. It was frozen, as was my phone so no photos of the iced path and icebergs in the Hudson. 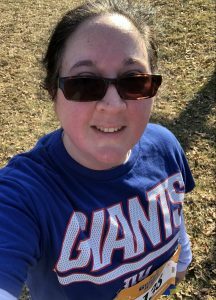 I treated it as a fun run to see how my ankle was two weeks post Half, and I had a blast. 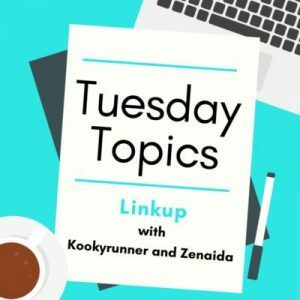 I’ll recap this Tuesday. My only goal was not finishing last, and I didn’t. Small races are nice, but harder to get lost in a huge pack. Sunday: speaking of a huge pack, 5,107 of my closest personal friends and I ran Central Park this morning. What a gorgeous day. Finishing without achilles crying was the goal. Done, and I even ran Cat HIll. More on Tuesday. Monday: I might miss this one. Depends, I have 8p theater tix so might get to gym before for a stretch. Saturday/Sunday: running one of the two, not sure which yet. Gym visits: 14 in January (so much stretching, cross training), 52 for September-February cycle. Wow, I don’t miss having to sweat out 50. Time to file for reimbursement. There were definitely no cell phones when I was dating my then boyfriend/now husband of 33 years. Eventually there was a flip . . . it took a long time to get a smart phone. No real need. I do have one of my email accounts on my phone, but don’t check it a lot. OTOH, I actually do catch up with stuff on vacations cause Mr. Judy doesn’t wake up as early as I do. The achilles is sounding very annoying. It needs to get with the program! But I think you’re doing a good job listening to it. I am unfortunately SOL with my favorite racing shoes and on the hunt for a new brand. Probably time to revisit Brooks more minimalist shoes, which is what I prefer for speed work & racing — but not for easy runs. It’s such an individual decision. If I took my laptop with me on vacation, I might. I don’t have a tablet currently but can’t imagine I’d enjoy trying to blog from those. I’ll check email from my computer but that’s pretty much why I give folks my cell. Emailing when we met up would not have worked. I agree — can you have a word with my Achilles please? How are the shoes feeling? I always say I need to run at least 6 miles before I know. Our local fleet feet is good at taking them back although the only time I did that were my trail shoes when the sole came partially off. In the race. They were definitely used but they let me exchange them. It was thankfully like the last mile or two. Still definitely not fun! I have my work and home email on my phone – I get alerts on the home one and also use it for officiating stuff. I haven’t used any of my new trainers yet! I have work email on my work phone, could log in via webmail on personal. 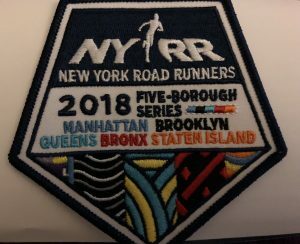 I love that 5 boroughs patch – it looks a lot better than the one I got a few years ago! 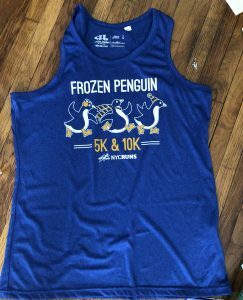 I’m obsessed with the frozen penguin shirt from your race! The patch was a lovely surprise. Had no idea they were a thing. No email on your phone? Is that even a thing? My email provider does a pretty good job of filtering spam, altho since the start of the year, I’m getting more spam than I’ve ever gotten. So annoying. Glad you were able to escape to the south! I assume your Penguin race was at home but I couldn’t figure out when you came back! Congrats on running in the cold weather. I flew home Monday mid afternoon. Funnily enough re: penguin, I was wearing the tee from the first one, which says stay frozen, while running to the beach and one woman said “no. Stay warm!” I head back down south next week for a bit. Thanks JetBlue for making it so easy. That penguin shirt is so cute! Kinda funny that it’s a tank top! I’m a huge fan of email. Gmail is so easy to search, I’d much rather have people send me an email than a text because I can refer to it again and find it. Due to my job, I have to have both my work and personal emails on my phone. I have work email on my work phone. Couldn’t get by without that, but then I do have the freedom to truly disconnect if I want to leave phone home one day. That’s a cool patch! I think the only running related patch I have is from the Marine Corps Marathon. And I never put it on anything. Florida sounds pretty wonderful about now! Seriously. Counting down the days until I fly back. I think my MIL stops in Florence on her drive up from Florida. Hotel gym treadmills can be a mixed bag. Glad the elliptical was an option. I use FB Messenger to communicate with friends when it’s not important/urgent enough to text. Outside of the racing season, Florence seems to exist solely as a snowbird waystation. Funny how many people stop there or Rocky Mount, North Carolina. Agree re: treadmill. At least this one wasn’t manual like the one near my brother’s old apartment. That patch is pretty cool! I love a 10K too even if it is freezing everywhere. I do still use email for stuff and FB messenger for group chats. Have a great week! yeah it’s all FB messenger or text for me. The text part makes me laugh as I was one of the last of my friends to get a texting package. I confess I am so very jealous of your ability to just pop out and run Central Park. It’s one of my favorite places to run. I would have loved to see the icebergs in the Hudson! I’m sure it was really frozen to run in. Glad that you’re feeling a little bit better. That patch is awesome! I saw someone wearing a varsity/bomber hybrid jacket the other day with all kinds of patches on it and it looked really nice. I am spoiled rotten by Central Park. Even before I ran, it was my good weather commute. I do most of blogging on my phone. (wordpress app) it’s portable. Once a week, I go on my laptop and fix the image sizes. Tell your achilles to SHUT UP. My arch thingie is weird. It doesn’t hurt when I run and several hours after it is sore but then it goes away the next day(mostly). It makes me nervous because I don’t know why. I should buy new shoes and see if that’s it. So expensive and I have so many already. 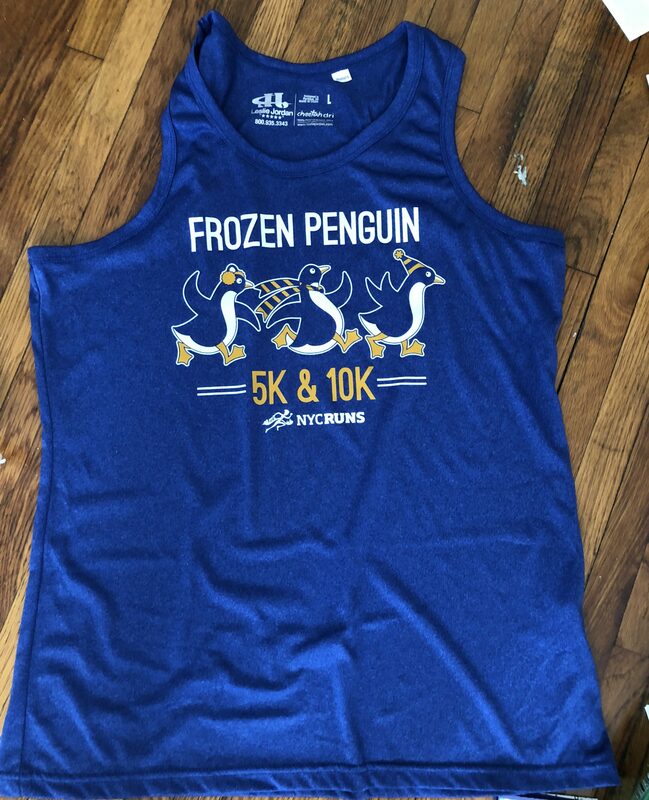 A tank for the frozen penguin – how appropriate. We used to have a summer hot 10 mile race that gave a long sleeved shirt What? See you in March for a catch up. Yeah it seriously needs to stop. I’m hoping PT helps, especially breaking down the scar tissue. On the plus side, doc didn’t blink when I said I had two Halfs in the next two months. She also gave me a shoe suggestion or two and one was the ones I tried so hopeful there. Can you get into a PT or podiatrist between travels? I ran yesterday and it felt fine. ???? I’ve only been married for 10 years, but when I chat with my single friends, dating is way different now. All the tinder, online, social media everything is so different! I like that patch! 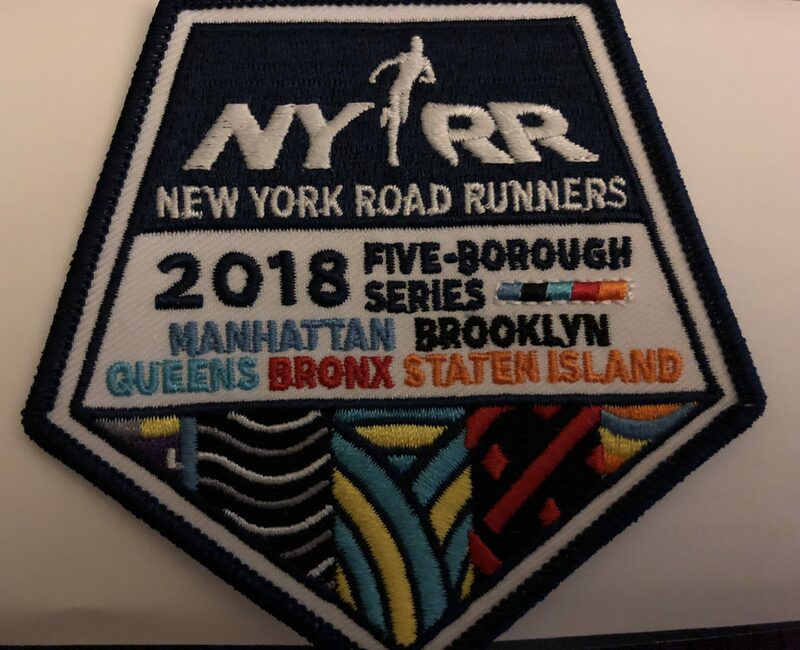 I have gotten patches from most of my marathons (key word:most), and I think they’re a neat keepsake…just have not figured where to put them yet. I’m leery of a jacket, because I don’t want them getting trashed/worn/dirty. I’d thought of a drawstring bag of sorts…but same (don’t want that getting dirty either). SO, for now, they area all hanging out in a catch-all box with a few other keepsakes. ooh I love the idea of a bag. That might work for a zippered tote I use as my gym bag. I feel like this one is sturdy enough to survive the washing machine visits that bag gets. Good luck with the new sneakers! I am still hunting for new ones after the ones I bought were a total flop. I’m so glad you had a blast at the Frozen Penguin and sounds like your ankle/achilles is healing nicely. I’m with you, rather have it feel 100% then push it too hard and risk going back to Square 1. Which shoes didn’t work for you, I forget. There’s no shame in disconnecting for a while – you’re smart for not having email on your phone! I should do the same 😉 That patch is super cool too. It would be fun if all races gave patches instead of race t-shirts, that would make for quite a fun race display! Hope the new sneakers treat you well and that your ankle/achilles continues to heal well!